Eating: Loves coconut milk yogurt! Goes absolutely crazy for it. His spoon skills are improving, so perhaps I'll let him attempt a cup solo one of these days. He's still a lover of blueberries and has recently added black beans & snap pea crisps to the list. Allergies: This now deserves it's own category (and probably it's own post). Finn & I have both been dairy free for over three weeks now. We have seen a noticeable difference in his eczema (no more flair ups and it's slowly healing). This has been a huge lifestyle change for me. I'll share more in a separate post. Sleeping: Typical for the cosleeping/breastfeeding baby. I think he is a slightly better sleeper than Liam, but he still wakes up at least 6 times a night. I seriously cannot say how wonderful a different perspective has been for me this time around. I know what to expect, and I'm fine with it. A little tired, but otherwise no big complaints. He takes two naps a day, sometimes in the carrier, sometimes the car, and if we are lucky the bed. However he takes forever to get to sleep these days (I blame FOMO), so that has been a new element. I'm curious... for those of you with two kids: What does the older child do while you are putting the younger one down for a nap? Likes: Crawling (at top speed, chasing down something he knows he shouldn't have). The stairs. Toilet paper. The cat food & water... The remote. Noisemakers of all kind. Our cats. When Daddy gets home from work. And of course, big brother. Milestones: This month was mostly spent picking up speed in the crawling department. And on the adorable side of things, he now has a tiny wave. He pulls up on everything and cruises. He'll let go for just a second or two or when he moves from one piece of furniture to another. My guess is that he'll be walking around 10 months. Liam walked at 10.5 months, and so far Finn has done everything just a tad bit sooner. I'm really excited of this milestone, so we are definitely encouraging him. Nicknames: Finnier, Finnaroo, Finner, & Huck. I love getting to know him more & more. He has this deep voice when he babbles (just like Liam) and loud little squeals. He knows what he wants at all times and is determined to get it. He tolerates a good deal of wrestling from big brother and will soon be able to attack him back. Each month has brought more & more interaction between the two boys. It really just keeps getting better & better! Oh goodness, that sweet little smile! He is just too cute. I love seeing him and Liam interact on snapchat and LOVED when Liam was his biggest cheerleader when he was crawling up the stairs! So sweet. Our 3 year old gets to play a N educational game on mommy's phone whenever I put N to bed. For her it's a huge treat so it occupies her long enough for me to lay him down. I cant leave her alone anywhere lol, so this allows her to be where I am without keeping up her little brother. She typically takes a nap at the same time N does in the afternoon, so during that time she's in her own bed. I spent soooo much time trying to get Reid to nap for many months. And I felt terrible for leaving Carter alone. He would play in the playroom or watch a show while I was rocking and bouncing. He is so precious! 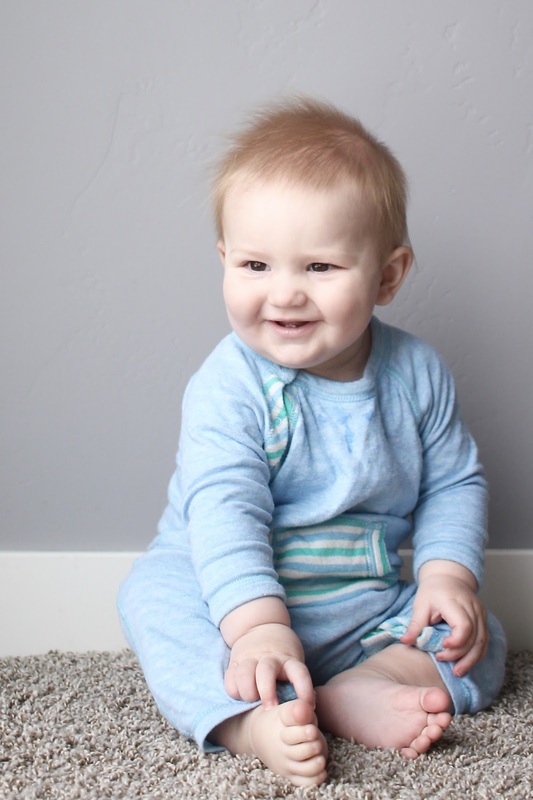 You'll be planning his 1st birthday before you know it! What a handsome sweetheart. He is definitely on the move and seems to be doing a lot quickly! Good job to little Finn! So cute!! I wish we lived closer. It sounds like our little guys are very similar! What on earth is it with kids and cat food!? Abbie went through a phase where she was after it ALL THE TIME. So crazy. I'm curious to hear more of how your dairy-free is going - I can't imagine my life without cheese! He's such a cutie. I love his hair in every photo! He's just the yummiest little/big guy! I adore everything about him. 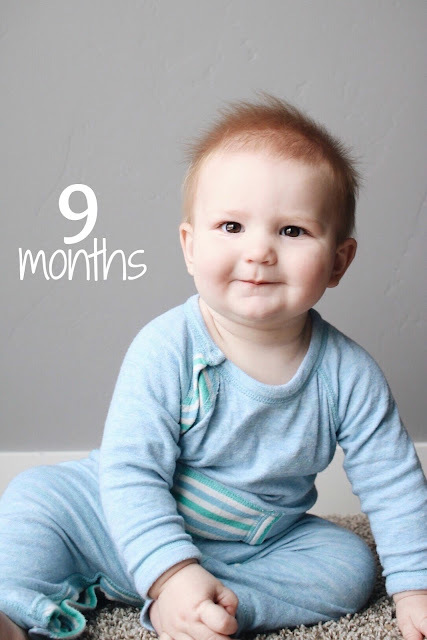 i can't believe he is only 9 months, and then i also can't believe he's already 9 months! time flies. i laughed at the toilet roll because yeahhh my cats love doing that as well haha. I love his chub! I haven't checked but I bet this was the size noah was, and he didn't thin out til he started walking. Oh my gosh, Finn! So stinking adorable! When Julia naps I try to use that as an opportunity for a little one-on-one time with Marcus. Be it snuggling on my lap while he watches a show, or we play games we don't normally get to while Julia is awake. 9 months already?! wow! i hear ya on the different perspective on sleep. although i love me some extra sleep, i don't seem to mind as much when she's up in the middle of the night. as for putting down for naps... the morning nap is rough because nora just cries for mommy at the threshold of evelyn's door while i'm trying to get her to sleep. so usually i get her a snack or something of high interest to keep her occupied, which doesn't last for long. the afternoon naps overlap (thank goodness!) so i put n down first, then get some quiet time with e, which is what i crave! and i can't wait to hear how dairy free has been for you! did it hurt your supply at all??? It hasn't hurt my supply at all. Typically, dairy has nothing to do with milk production. Plus, I already have a massive oversupply, so I don't really have to ever worry about that. A curse and a blessing all at the same time. happy 9 months Finn!!! I can't believe he's 9 months already. i swear these second kiddos are growing at a much more rapid pace than the first ones! also, i keep reading about you on snapchat, but I don't have you.....i MUST get your username!! !